In December of 2017, Daniel Negreanu announced the PokerStars Players Championship (PSPC) - a massive $25,000 buy-in event with a difference. When the dust settled, the PSPC ended up being the largest $25K field in history, blowing past the previous record of 639 entries, to finish at an astonishing total of 1,039. That brought the total prize pool to $26,455,500 with $5.1 million up top for the winner, and six places worth more than $1 million. Platinum Pass winner Ramon Colillas took down the biggest prize, while Marc Perrault was the best Canadian, finishing sixth for just over $1 million. While most $25K buy-in events are limited to a select field of elite players who either have the bankroll to fund the buy-in themselves, or the demonstrated skills to be able to sell action, the PSPC was different from the start as Negreanu announced the Platinum Pass at the same time. The Platinum Pass represented free entry to the $25K PSPC, as well as $5,000 spending money for a massive $30,000 value, and PokerStars dumped more than 300 of them into the kitty. The Platinum Passes were available to be won in a variety of ways. Players who won an EPT or PokerStars event in 2018 had a very good chance of finding a Platinum Pass added to the winners prize. Some passes were given away on PokerStars in freerolls or through other poker play. But many of the passes ended up going to "regular people" through various social media giveaways and challenges. Members of PokerStars Team Pro Online offered passes to their Twitch followers through challenges, and passes were given away in random draws, flipaments, and a variety of other ways. In one of the more talked-about challenges, Canadian streamer Arlie Shaban was tasked with "The 12 Labours of Arlie" to win his pass as the year drew to a close. The Challenge included 12 increasingly difficult tasks for Shaban to complete, culminating in the task of convincing noted poker commentator and outspoken critic Joey Ingram to accept a pass to attend the event. Ingram agreed, but raised the stakes by demanding PokerStars add another pass to the deal for an American player who captured hearts with a poker-themed Christmas present. The addition of the Platinum Passes changed the demographics of this $25K, and allowed it to blast through all previous records into a class of it's own. While many of the passes went to very competent poker players, many of the passes were also given away in random ways, or through challenges that didn't directly involve poker skill. That left the impression that the field of the PSPC would be "softer" than the average $25K tournament, and it gave extra incentive to pros and grinders who didn't manage to score a Platinum Pass to plunk down the cash for entry and helped encourage the record turnout. Among that record turnout were 97 Canadians, 12 of whom won their way into the event through a Platinum Pass. Of those 97 Canadians who started Day 1, 17 survived long enough to take home some cash from this unique event. Included in the Canadian cashers were all three of the poker-playing Greenwood brothers. Luc Greenwood was the first of the brothers to exit, collecting $39,500 for 98th place. Brothers Sam Greenwood and Max Greenwood made it a bit farther, as each pocketed $69,100 for 49th and 47th place respectively. Andrii Grynechko was the only Canadian Platinum Pass winner to make it through to the paying spots, and he collected $69,100 for 55th place. Four Canadians made it as far as the final two tables. Louis Boutin won $202,400 after being the first player to exit from the final two tables in 16th, while Griffin Benger grabbed $229,700 for 14th. Top Canadian and top woman in the world for 2018, Kristen Bicknell, managed to last until 11th place, and started her 2019 on the right note with a $328,500 cash. The top Canadian in this record-breaking tournament was Marc Perrault, who hit the final table as the short stack, but managed to ladder up a couple of times before finally falling as the first $1 million winner in sixth place. In a near-perfect conclusion, the biggest prize went to a Platinum Pass winner from Spain, Ramon Colillas. He came into heads-up play as a nearly 2:1 chip dog, but he managed to grind it out for the win. 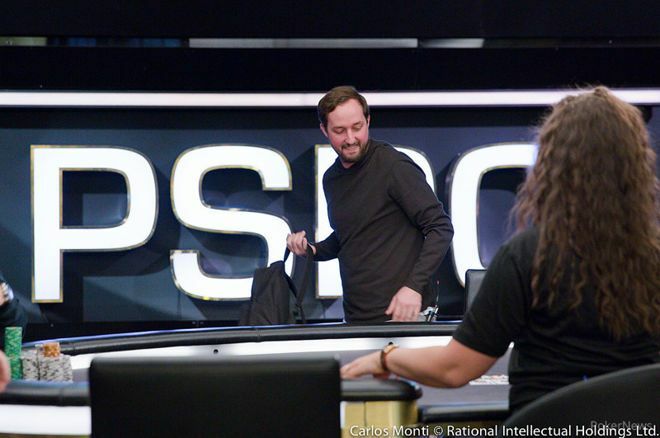 The turning point heads-up came in a monster hand when second place finisher Julien Martini flopped a flush only to see Colillas go runner-runner boat to get a massive double-up. From there, the Spaniard never looked back, pocketing $5,100,000 for the win. It always seemed likely that a $25K tournament where the sponsor was giving away more than 300 entries would end up as one of the biggest fields in history. That milestone dropped by the wayside very early, but the entries just kept rolling, leaving the PSPC as the undisputed leader in $25K fields. More than that, to a player, it was reviewed as one of the best poker experiences of their lives.